Buying the CD version of “Awesome Mix: Vol. 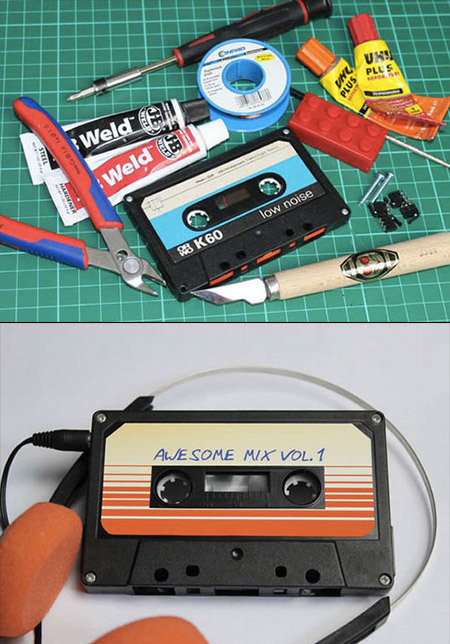 1” just isn’t enough for some fans, so why not make your own version that doubles as an MP3 player? That’s exactly what Instructables user “BrittLiv” did, and the resulting device is something worthy to be placed in Marvel’s next installment. On a related note, did you know that the soundtrack album reached number one on the US Billboard 200 chart, becoming the first soundtrack album in history consisting entirely of previously released songs to top the chart? Continue reading for more pictures and a link to the actual instructions page.The first step is: “Start by taking the MP3 player apart. The bottom can easily be lifted off with anything sharp. There is a single screw next to the SD card, holding the board in place. Unscrew it and take everything out of the shell.Remove the sticker from the buttons and unsolder the battery. You will also have to remove the audio plug, the on/off switch and the micro USB jack. A rework station is certainly helpful in fulfilling this task. Make sure to keep all the unsoldered parts, you will need them later on.” Instruction page.